The RCEP ministerial meeting is taking place today, 12th November, 2018 in Singapore. It will be followed by Leaders’ Summit on 14th November. There are clear indications that countries want to wrap up the negotiations that started in 2012, and thus discussions in this ministerial round are crucial. RCEP is a trade deal among 16 Asian countries which are host to almost 50% of world’s population. 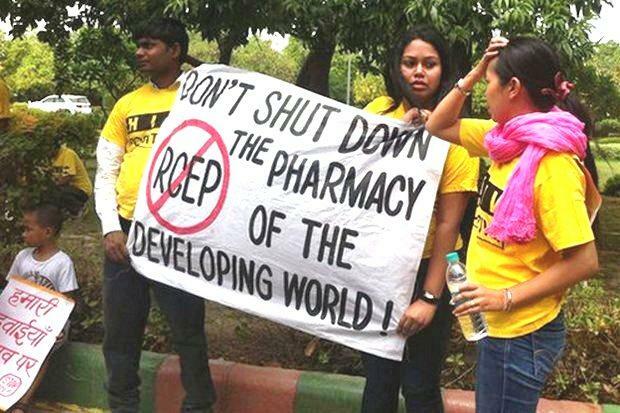 Civil society organisations, patient groups and health activists have been concerned about intellectual property (IP) provisions being discussed in RCEP which undermine access to medicines and affordable treatment for patients for communicable diseases and the growing burden of non-communicable diseases. IP provisions going beyond the standards of the World Trade Organisation’s TRIPS agreement such as data exclusivity, patent term extension and IP enforcement have been inserted by Japan and South Korea, which harm future accessibility of cheaper generic medicines. One of the major issues with RCEP as well as other bilateral and multilateral trade negotiations is lack of transparency. The matters are discussed behind closed doors without accountability to parliament or affected communities. No position papers on IP chapter have been made available or impact assessments conducted and published. Furthermore, the Constitution requires the Legislature to oversee the work of the government (executive). In this regard, Parliament, as the representative of the people of India, has a duty to ensure that trade deals benefit people; do not undermine public interest and the right to life. However, today the Indian Parliament has little control over the outcomes of the negotiations which the executive undertakes on behalf of the country. Signed trade deals may not always be in the national interest but the Parliament cannot alter the terms of the agreement, once signed by the executive. Governments engaged in bilateral and regional trade and investment treaties should ensure that these agreements do not include provisions that interfere with their obligations to fulfil the right to health. As a first step, they must undertake public health impact assessments. These impact assessments should verify that the increased trade and economic benefits are not endangering or impeding the human rights and public health obligations of the nation and its people before entering into commitments. Such assessments should inform negotiations, be conducted transparently and made publicly available. In run up to the current round of negotiations in Singapore, the Indian civil society organisations and individuals who work on health, IP and trade have written to the Commerce Minister Suresh Prabhu asking India to completely reject damaging IP proposals.